My husband works from home at least once a week, and it’s nice to have him home during the day when the kids are at school so we can get down and dirty. And by ‘down and dirty’ I mean he works and I try to get my work done at home, which is sometimes hard to do when someone else is there and they totally mess up your groove. It’s important to do things that make his working from home experience smoother because I think we can all agree by now that working from home is not easy. There are so many distractions like snacking and napping and laundry and cleaning toilets OMG totally kidding cleaning toilets is why we had children. Anyway, I am keen to support him because his job is important for my chocolate and Combos habit and everybody knows that’s the most important thing. - Stand outside his door when he’s on a call and talk like I’m the one on the other end of the phone. Alternately, echo his end of the conversation. “The proctologist is on the phone for you." “Did you pick up your hemorrhoid meds yet?" “We owe the bookie five thousand, right?" “Do you want another whiskey?" “Are you talking to that jerk again?" - Narrate my own activities opera-style. - Crank up the Jewel station on Pandora. 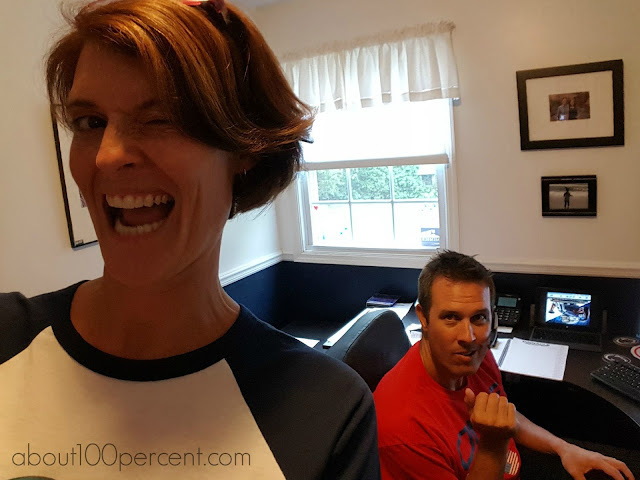 - Take a series of sassy selfies with him while he’s on a conference call. - Sit in the living room with two glasses of wine and pretend to have a conversation. When he comes in, introduce him to my new friend Suzanne. - Sneeze continually for two minutes. - Do yoga in his office. When in corpse position, shush him loudly. - Drag a kitchen chair into his office and make several personal calls at his desk. - Change my outfit several times a day so that every time he sees me, I’m wearing something different. - Ask him to spot me while I practice my back flips. - Enter his office with a line like "Are ya workin' hard or hardly workin'?" and leave with a "See you in the funny papers!" or something equally hilarious. - Practice my horror movie screams. - Challenge him to a dance-off. - Pretend to be his secretary. Call him “sir” and tell him his wife is on the phone and shall I order some flowers? - If at any time he asks me to please leave him alone, tell him I quit. This is hysterical. I don't know if you *actually* do these things, but if anybody did, it would be you. Also, I can't decide if I would laugh with you or murder you if I were the hubs. "...he works and I try to get my work done at home, which is sometimes hard to do when someone else is there and they totally mess up your groove." This is totally us when Bill works from home. He messes up my groove big time. I write off every single day that my husband works from home. And by "write off" I mean I either hide or spend the day out of the house. Either way I get nothing done.